Education is a human right and the single most important factor in eradicating poverty and ensuring that individuals and communities acquire the knowledge and skills to ensure sustainable human and social development. Yet, the world is facing a critically low level of investment in education. There are today 264 million children and youth not going to school. There are still more than 100 million young people who cannot read. The number of adults with no literacy skills is 753 million. To reach the Sustainable Development Goal for an inclusive, equitable and quality education for all (SDG4), global spending on education must rise annually from $1.2 trillion per year to $3 trillion by 2030. To deliver on the promise of SDG4, we must boost investment in education. The Education 2030 Framework for Action puts it clearly: Governments must allocate 4-6% of their gross domestic product and/or 15-20% of total public expenditure to education, ensuring efficient spending and prioritizing the most marginalized groups. The call for external financing is also crucial. Bilateral and multilateral donors are urged to increase the share of their aid allocated to education of the recommended overall target of 0.7 per cent of GNP for official development assistance. The Global Partnership for Education (GPE) replenishment marks the beginning of a new era in education financing to reverse the trend of declining aid for education. With increased disbursements over time, GPE has become the second largest multilateral donor to basic and secondary education. Through scaled-up GPE disbursement of US$2 billion a year by 2020 and US$4 billion a year by 2030, the education sector will have a chance to have a fund similar to those that have demonstrated large -scale success in the health sector. We, members of the global multi-stakeholder SDG-Education Steering Committee, all share a common vision and a commitment to action. 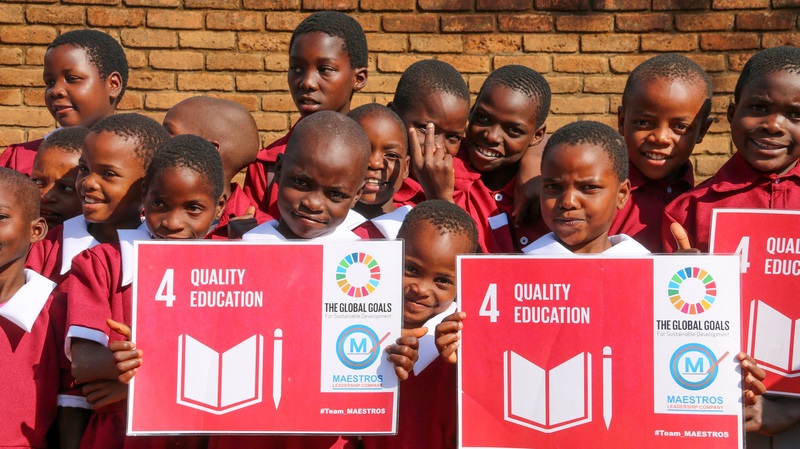 We all reaffirm that the fundamental responsibility for successfully implementing the SDG4 lies with governments, and that education is a political and societal responsibility. Now we must act, through political will, sound policies, strengthened partnerships and improved financing. Endorsing that vision, the SDG-Education 2030 Steering Committee, supports the replenishment campaign of the Global Partnerships for Education in view of ensuring the right to an inclusive and quality education and lifelong learning opportunities for all by 2030. The Steering Committee is composed of 38 members representing a majority from Member States, the World Education Forum 2015 convening agencies, international and regional organizations, teacher organizations, civil society networks, as well as representatives from the private sector, foundations, youth and student organizations. Current members include: Argentina, Bangladesh (E-9), Belgium, Benin, Bolivia, Brazil, China, France, Japan, Kenya, Latvia, Norway, Morocco, Oman, Republic of Korea, Russian Federation, Saudi Arabia, Ukraine and Zambia; ABEGS, ADEA, Council of Europe, European Commission, SEAMEO and OEI; UNESCO, UNICEF, UNDP, UNFPA, UNHCR, UN Women, ILO and the World Bank; Global Partnership for Education and OECD; Education International, GCE, ASPBAE, Education Above All, United Nations Global Compact and a youth representative.